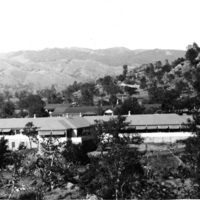 Photographs of the Stony Brook Retreat, Kern County's tuberculosis facility in the first half of the 20th century. 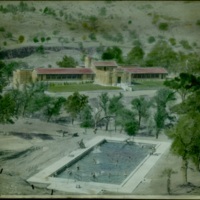 This hand-colored picture of Stony Brook, scanned from a framed picture, shows the main hospital building with lawns and curbs, and a perfectly rectangular swimming pool, in contrast to their appearance in 1928. Shows several buildings of the Stony Brook Retreat. 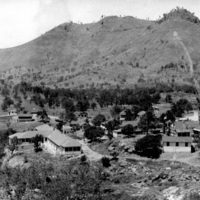 Access road is visible at right. Shows building at Stony Brook, with awnings and veranda extending its entire length.